Inspiring the next generation of manufacturers was the theme at the 5th Annual Manufacturing Day Expo, held recently at Northwest State Community College in Archbold. The event brings manufacturers and high school juniors and seniors together to teach the students about the number of opportunities available to them in northwest Ohio. This year’s event hosted 40 area manufacturers and almost 400 area students. The event is planned and coordinated through a partnership of NSCC’s Custom Training Solutions, Henry County CIC, and the economic development corporations of Fulton, Williams, Defiance, and Paulding counties. https://www.fcnews.org/wp-content/uploads/sites/45/2018/11/web1_FCCC-manufacturing-day.jpgInspiring the next generation of manufacturers was the theme at the 5th Annual Manufacturing Day Expo, held recently at Northwest State Community College in Archbold. The event brings manufacturers and high school juniors and seniors together to teach the students about the number of opportunities available to them in northwest Ohio. 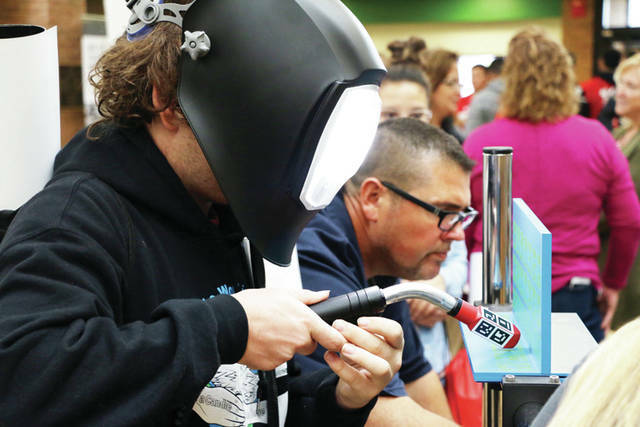 This year’s event hosted 40 area manufacturers and almost 400 area students. The event is planned and coordinated through a partnership of NSCC’s Custom Training Solutions, Henry County CIC, and the economic development corporations of Fulton, Williams, Defiance, and Paulding counties.